We've lived in the age of Internet-enabled information and entertainment for more than a decade and a half now. But you sure can't tell that from the state of car electronics: Even now, the devices built into many dashboards remind me as much of the push-button cassette deck on my first car  an extremely used 1982 Jetta  as they do an iPhone or any other 21st-century gizmo. Why have automobiles been such underachievers, digitally speaking? It's not in the industry's nature to adopt the rapid-fire product cycles and seat-of-the-pants attitude of the rest of the tech business. For some odd reason, people who work in a field where the word crash brings to mind human injury rather than balky software tend to work slowly and methodically. There's reason for hope, though. At last month's International Consumer Electronics Show (CES), more car manufacturers than ever showed up alongside the makers of HDTVs, PCs, phones, and other devices. And they brought goodies with a refreshingly modern feel. Audi, for instance, provided a sneak peek of the next version of its MMI system; instead of running some cheesy proprietary mapping application, available later this year in the A8 and other models, it will offer Google Earth in all its three-dimensional glory. Toyota's Entune, also due to arrive later this year, connects to your Bluetooth phone to get online. It will run in-dash apps you can control by touch or voice, including Bing's search engine and the Pandora personalized radio service. Partnerships with OpenTable and MovieTickets.com will let you plan dinner and a movie after you've already in transit. GM is taking a different approach with its OnStar service: Instead of beefing up the version which it's long used as a lure to sell Chevys, Buicks, and Cadillacs, it's making it available to Chryslers, Scions, and VWs. At CES, the company announced that would bring the safety and information service to other manufacturers' cars for the first time, by building it into a $299 aftermarket rear-view mirror that's compatible with most vehicles. It goes on sale at Best Buy and other retailers this spring. 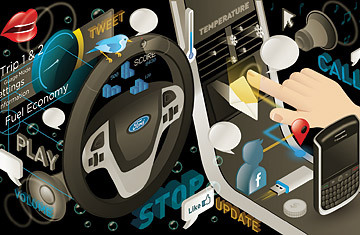 AppLink debuted last December in Ford's 2011 Fiesta and is coming next to the 2012 Mustang; other models will follow. But the automaker is an old hand at this stuff, relatively speaking: Since 2007, it's sold 2.5 million cars and trucks equipped with Sync, which it codeveloped with Microsoft. I got to test-drive a 2012 Ford Focus Titanium hatchback  due to hit dealers this spring  decked out with MyFord Touch, the fanciest incarnation of Sync. MyFord is standard on the Titanium; it's $995 when bought as an option, or $1790 with map-based navigation. While the Focus isn't yet compatible with AppLink, it's otherwise an uncommonly well-connected car. You interact with MyFord using an 8" color touchscreen, an auxiliary display that sits between the speedometer and the tachometer, and speech input and output. Features include navigation with access to traffic and local-business information; satellite and HD radio; voice input and output, Bluetooth, dual USB ports, and A/V jacks for hooking up phones, MP3 players, and other devices; and an SD slot that lets you stream your music collection from a memory card. The set-up reminded me both of a conventional circa-2011 PC and Knight Rider's KITT. When I connected my iPhone, it immediately began indexing the music therein so I'd be able to control it by speaking; when I used potentially-distracting features, its robotic female voice gently admonished me to drive carefully. Despite the Touch in MyFord Touch, I instinctively used its speech input rather than the touchscreen whenever possible  it just felt safer. But while talking to the car often worked well, it struggled to understand some words, such as Petaluma, the name of the Northern California town that was one of my navigation destinations. At one point, it thought I was asking for music by 50 Cent when I was really requesting Dusty Springfield. And it simply seemed to be unaware of some of the channels offered by Sirius satellite radio, such as MSNBC and POTUS. The more I used the system, the better I got at working around these and other quirks, and the more I enjoyed it. But neither it nor the other new products from other manufacturers match the slickness and sophistication of the best smart-phone apps. What I really crave is an in-dash equivalent of Siri, the astounding iPhone app  based on $150 million of Defense Department artificial-intelligence research and acquired by Apple last April  that lets you say stuff like "Find me sushi in Cambridge" and "Where is The King's Speech playing?" I'm confident that automotive apps that advanced will arrive sooner or later  although with the pace of the industry, I wouldn't bet on the "sooner" part. Even now, though, Sync and its rivals have me guiltily trying to rationalize buying a car to replace the perfectly adequate one I already own. It's a pleasure to step into a new automobile without feeling like I'm traveling back in time.